1) Make sure your financial house is in order. It’s always important to make sure your finances are strong, but in a seller’s market, this becomes even more important. Check your credit for inconsistencies or blemishes. If you can bolster your savings account, this would be the time. When making an offer on a home, you don’t want any paperwork issues getting in the way of closing on the home of your dreams. When making an offer on a home, if you do so with an official underwritten pre-approval under your belt, it offers leverage in your favor and shows the seller that you are serious about making the deal happen. Our team has multiple loan programs available for buyers in every phase of life. There are even zero down options for some qualified buyers*. And, we make it easier than ever to apply and become pre-approved. First, check out our handy MORTGAGE APPLICATION CHECKLIST, gather your info, then APPLY ONLINE or on the fly by texting “simple” to 48421. 3) Find a great Realtor® and place your trust in their expertise. A real estate agent is there to help advise you every step of the way throughout your home buying journey. The great ones will also be well informed about market conditions in their area. They can help you develop a strategy for locating the best home for you and placing a smart offer. In a seller’s market, there may be multiple offers placed on a single property. Your agent can help you determine how to compete without offering over the home’s real value. 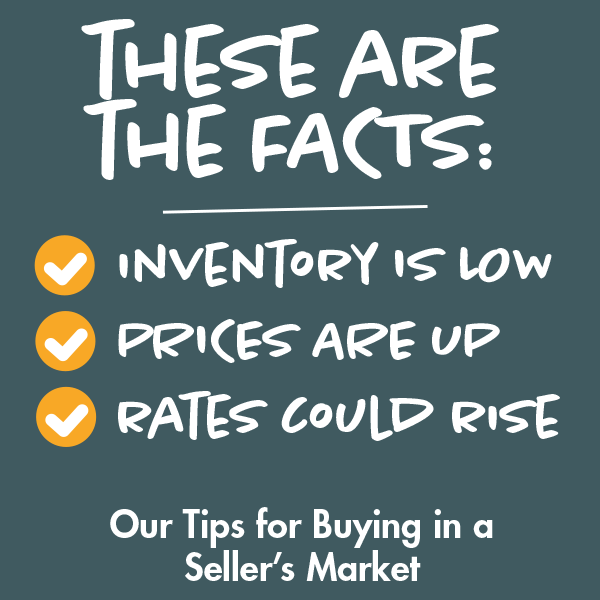 A seller’s market can be easily navigated with the right guidance. Call us at 877-892-8222 for more details. *Zero down programs are dependent upon your individual financial situation and loan qualification requirements. DESTENI MASON NAMED ONE OF 75 “ELITE WOMEN IN MORTGAGE”How to use a Credit Card to IMPROVE your Credit Score!